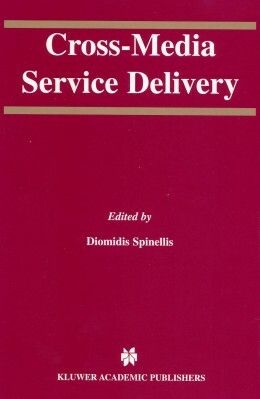 Diomidis Spinellis, editor. Cross-Media Service Delivery. Kluwer Academic Publishers, 2003. ISBN 1-4020-7480-8. Cross-Media Service Delivery is of interest to professionals and academics working in content authoring and electronic publishing platforms; as well as in media and broadcasting. The digitisation of traditional media formats, such as text, images, video, and sound provides us with the ability to store, process, and transport content in a uniform way. This has led the formerly distinct industries of media, telecommunications, and information technology to converge. Cross-media publishing and service delivery are important new trends emerging in the content industry landscape. Mass-media organizations and content providers traditionally targeted content production towards a single delivery channel. However, recent economic and technological changes in the industry led content providers to extend their brands to cover multiple delivery channels. Following the content industry trend to "create once and publish everywhere"-COPE, a number of architectures, technologies, and tools are currently being developed and deployed to facilitate the automatic conversion of content to multiple formats, and the creation of innovative multi-platform services. This new approach enables the seamless access to information over different network infrastructures and client platforms. This work uniquely brings together a cross-disciplinary core of contributors to address the technical and business issues of cross-media publishing and service delivery. The contributions are organized into four different areas: the business issues driving the requirements for cross media content delivery, the architectures used for delivering content to multiple platforms, technologies that address specific practical problems, and, last but not least, concrete applications. If you would like to review a copy for a magazine or Web site, drop me a line. If you see any reviews or references, please send me copies, URLs, etc. (C) Copyright 2001-2008 D. Spinellis. May be freely uploaded by WWW viewers and similar programs. All other rights reserved.